This month we are announcing the release of support for Azure Active Directory (AAD) authentication in Azure Media Services. Customers of our REST API and .NET client libraries can now use AAD authentication to authorize requests. In addition, we are releasing a new management blade in the Azure Portal to simplify the usage of User and Service Principal authentication with AAD. With the release of this update to our REST API, we are now able to provide the same role-based access management (RBAC) as provided by the Azure Resource Management (ARM) service. By moving to AAD authentication you will also now be able to track and audit all changes made by specific users or an application connected to your Media Services account. 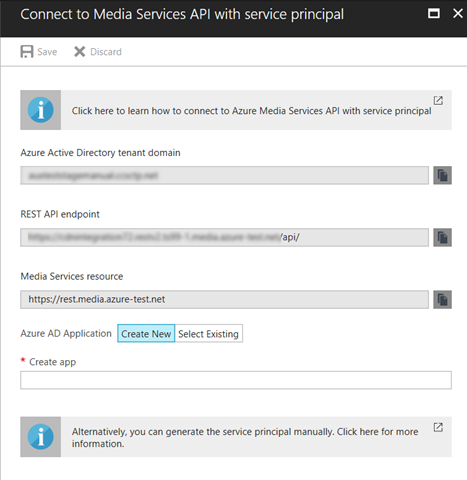 The new Azure Media REST API requires that the user or application making REST API requests must have either contributor or owner level access to the resources it is attempting to manage. More details on how role-based access control works for Azure resources is available at Azure Role-based Access Control. Because Azure Active Directory provides powerful role-based access control features and support for more fine-grained access to resources in your account compared to the ACS token authentication model ("account keys"), we strongly recommend that you update your code and migrate from ACS to AAD-based authentication by June 22, 2018. Also, a key reason for the rapid migration is the upcoming announced deprecation of the ACS key based authentication system. Microsoft Azure Media Services will end support for Microsoft Azure Access Control Service (ACS)-based authentication on June 22, 2018. To provide customers sufficient time to update their application code, we are providing 12 months' notice to manage the necessary transition. Update the code for your applications authored for Media Services. Mitigation steps must be taken on or before June 22, 2018 to ensure your applications authored for Media Services using ACS authentication tokens will continue to function as expected without failures in production. Please review each of the new authentication scenarios below closely and take the appropriate action to update to using AAD authentication in your source code. 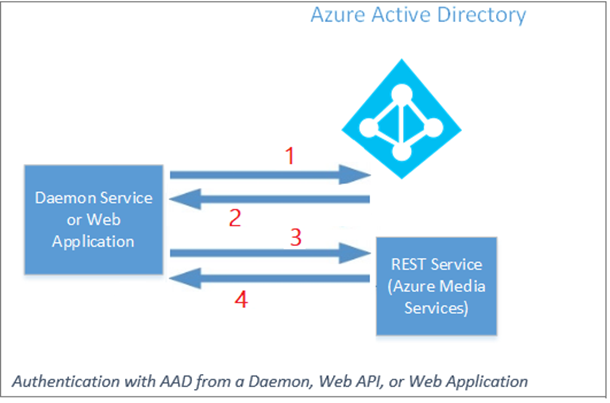 The Azure Media Services REST API supports authentication for both interactive users and web API, middle-tier, or daemon applications. The following sections provide details on how to use AAD authentication when working directly with the REST API or through the .NET client library. Management application for desktop or mobile users to administer resources in a Media services account. 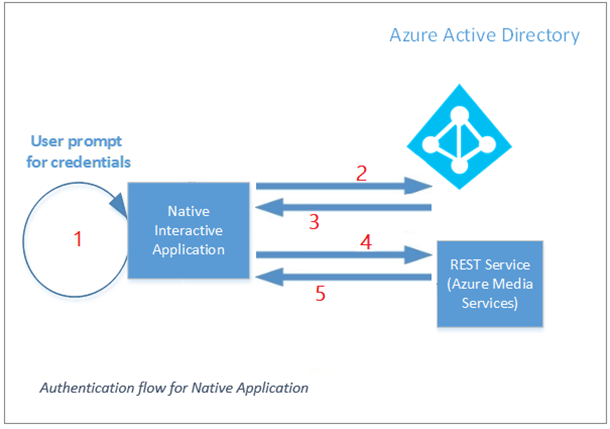 A native application would first acquire an access token from Azure Active Directory and then use that access token to make all REST API calls. The following diagram shows a typical interactive application authentication flow. 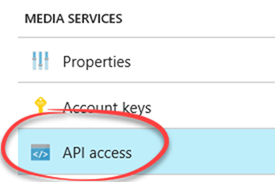 For a REST API request to succeed, the calling user must be a “Contributor” or “Owner” of the Azure Media Services account it is trying to access. Unauthorized requests would fail with status code 401. If you see this failure, please double check that you have configured your user as “Contributor” or “Owner” on the Media Services account. You can check this through the Azure portal by searching for your media account and clicking on “Access control” tab. Users of the .NET client SDK for Media Services must upgrade to the latest version on Nuget (windowsazure.mediaservices version 4.1.0.1 or greater) to use AAD authentication for communicating with REST requests. The following example shows the differences between how to authenticate with the .NET client SDK previously using ACS and the new way that uses AAD credentials. NOTE: Applications will also need to update their references to include a new assembly "Microsoft.WindowsAzure.MediaServices.Client.Common.Authentication.dll" and add references to that namespace as well as reference to the "Microsoft.IdentityModel.Clients.ActiveDirectory" assembly to get access to the ITokenProvider interface. For more information and a detailed sample on using the .NET SDK with AAD see this overview and the available environment settings and constants. // Create and cache Media Services credentials in a static class variable. // Used the cached credentials to create CloudMediaContext. The "AzureEnvironments.AzureCloudEnvironment" constant is a helper in the .NET SDK to get the right environment variable settings for a public Azure Data Center. It contains pre-defined environment settings for accessing Media Services in the public data centers only. For sovereign or government cloud regions, you can use the " AzureChinaCloudEnvironment", "AzureUsGovernmentEnvrionment", or "AzureGermanCloudEnvironment" respectively. A lot of the details regarding acquiring an AAD access token has been wrapped and simplified for you in the AzureAdTokenProvider and AzureAdTokenCredentials classes. For example, you do not need to provide the AAD authority, Media services Resource URI or native AAD application details. These are well known values that are already configured by the AAD access token provider class. If you are not using our .NET client SDK, it is recommended to use the ADAL Library to simplify the creation of the access token request using these parameters. The following values are used by default in the AzureAdTokenProvider and AzureAdTokenCredentials classes. You also have the option of replacing the default implementation of the AzureAdTokenProvider with your own implementation. For non-human interaction through daemon services, Web APIs, Consumer (mobile or desktop), and Web application, where interactive login or direct user management/monitoring of resources in the Media Services account is not required, you will need to first create an Azure Active Directory application in its own tenant. The following examples show how a daemon application may use AAD web application credentials to authenticate requests with the REST service. Azure Active Directory authentication could be complex for users unfamiliar with the details of AAD, so we wanted to make it very easy to get started with very little knowledge of AAD. For that reason, we are introducing a new "API Access" blade for Media Services accounts in the portal that will replace the previous ACS "Account keys" blade. We are also disabling the ability to rotate the ACS keys to promote users to update their code and move to AAD support. 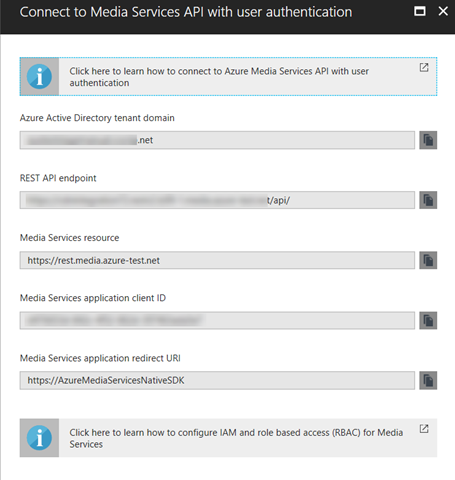 The new API Access blade makes the process of connecting to Azure Media Services with AAD much simpler. When you first select the API Access blade, you will be presented with a choice of using either user authentication for human interactive management applications or creating a Service Principal and AAD application for non-human interaction with the Media Services API. When selecting the user based authentication option, you will see a new panel that contains all the Active Directory information needed to authenticate with the API. This includes the API endpoint that you need to call, along with the ClientID, Domain, and Resource. For Service Principal authentication, you will see additional values and the ability to select from an existing AAD Application or create a new one directly in the panel. After creating or selecting an AAD app, you will be able to create and copy a Key (Client Secret) and copy the Client ID (Application ID) which are required to get the access token in this scenario. In the blade, you can choose to “Create New” AAD Application, or select from an Existing one in your Subscription. When selecting an existing one, you will see a new blade listing your existing applications to choose from. Once you select from an existing application or create a new one, you will see additional buttons to “Manage Permissions” or “Manage Application”. You can use these settings to open the AAD application management blade directly to perform management tasks such as changing keys or reply URL or customizing the applications manifest. Clicking on the Manage Application button will bring up the AAD application management blade which allows you to create Keys for use with the API using this application. If you do not have permissions to create AAD apps in your Domain, the AAD app controls of the blade are not shown and a warning message is shown instead. We are very excited to be making the transition from the older ACS key-based authentication to the more secure, flexible, and role-based Azure Active Directory service. All Azure Media Services customers should begin immediately to migrate to use the new AAD based authentication model by downloading the latest .NET SDK or updating their existing REST-based API calls. In addition, we are working on a new version of our REST APIs with support for more client SDK languages with AAD authentication. More details on that updated API will come in a later blog post. If you are using.NET, update to the latest SDK and migrate to AAD authentication. Plan early for the deprecation of ACS authentication support in Media Services API. The older ACS authentication support will be shutting off officially on June 22, 2018. If you are currently using the Java SDK or one of the many community or open source generated client SDKs for Media Services, you have a couple of options at this time. Azure Media Services client SDKs for both JAVA and PHP now support Azure Active Directory (AAD) Authentication. To get the latest Java SDK release see the details in our Java documentation. To download the latest PHP SDK for Media Services, look for version 0.5.7 of the Microsoft/WindowAzure package in the Packagist repository. For other open source libraries, since these are not supported directly by the Media Services team, you would need to work with the community SDK developer to prioritize updating the SDK to support AAD for your scenario. In addition, we are working hard on an updated REST API (v3) that is coming out in 2018 with support for AutoRest generated client SDKs across PHP, Java, Python, and more which will support AAD authentication. We will be following up with more blog posts on migrating to the new v3 API and client SDKs when they are ready for preview. PHP SDK with support for AAD is available in version 0.5.7 of the Microsoft/WindowAzure package in the Packagist repository. As always, if you have any questions, comments, or feedback, please post a message or question to our MSDN Forum or use Stack Overflow. For direct support, please submit a support request through the Azure Portal. We are also available on Twitter via @MSFTAzureMedia.